Some people feel that wagyu beef is wasted in a burger. I beg to differ. For, surely, not every part of even the most delicious of cows is destined to be tataki or steak at a fancy restaurant. I am more than happy to have these other cuts minced and transformed into a luxurious pattie. So when Huxtaburger (106 Smith St, Collingwood) opened in December last year, I casually suggested to Simon that we should stroll over for a visit. It was a flurry of activity on that warm evening - impressive for a place that had been operating for only a week at the time - and we were lucky to get a seat outdoors. Huxtaburger's menu is a simple one. Five burgers, all with Moondarra-sourced wagyu beef patties. Chips/fries are available, too, of course, and they also have a 'salad of the day' option for vegetarians - the day we went, it was roasted cauliflower, quinoa, Meredith goat's cheese, pomegranate and mint, which I very nearly ordered, as it sounded quite lovely. But that night, it was all about the burgers for us. Fans of The Cosby Show will get a kick out of the burgers, in more ways than one. Except for the eponymous Huxtaburger burger, the other burgers are all named after characters of the sitcom - Bill, Rudy, Denise and Theo. I opted for Denise (the hot one) - with jalapeno and sriracha mayo. Simon went for Theo - with bacon, double pattie, double cheese and barbecue sauce. We both enjoyed our burgers - the wagyu patties were delightfully sweet and juicy, the seasonings were just right, and there was a pleasing contrast with the soft buns and their crisp sesame-crusted exterior. The prices of the burgers at Huxtaburger fall around the 10-dollar mark, and they venture towards the petite side as far as Australian appetites go - I was reasonably satiated, but Simon said that he could almost devour another one, which, admittedly, may also have something to do with how tasty they were. Overall, given the quality, I find them to be good value for money. When Simon comes back from his overseas trip, I look forward to another visit together for more beefy burger goodness. And hey, we might even try the salad. I wish I could have one of these! I think every fast food dish or basic home dish can be brought to the level of haute cuisine if made with excellent products, so I think making hamburger with wagyu beef is an excellent idea. Yes, great ingredients make such a difference don't they? They really were scrumptious burgers. Denise would have been mine, too. All beef prices seem to have skyrocketed around here. Mr. Rosemary says we should raise our own! Ha, it would be awesome if you could pull that off! The other alternative... I hear of people who purchase a cow directly from a farmer, have it professionally slaughtered and that's many months' worth of meat they can keep in the freezer. I keep seeing such good reviews for this place ... you almost have me convinced that it's worth the hike to Collingwood to try. I love a good burger. S and I went on a mission to find the best one in Canberra last year. They really can be fantastic food when done well and this looks just great. I totally have no idea about The Cosby Show references, although I have at least heard of the show! Gotta respect a burger place that can actually do an inventive, substantial salad. Woot! I only knew this because so many websites mentioned it. 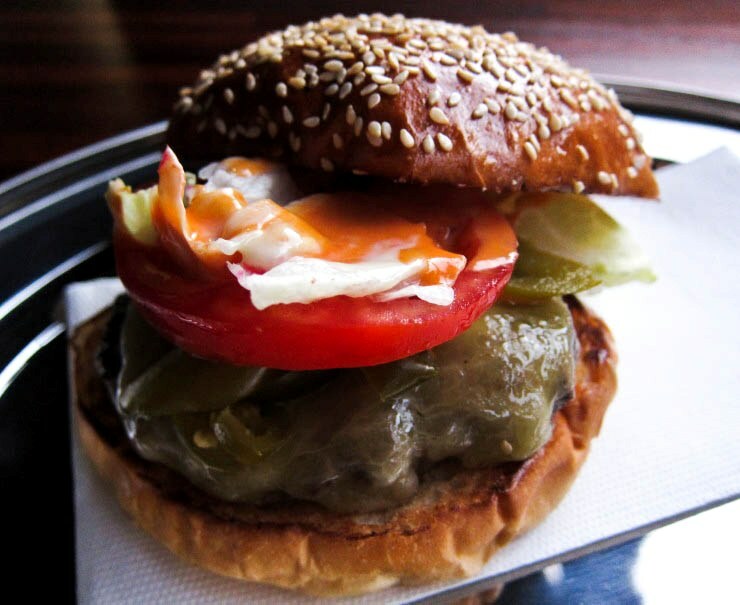 Huxtaburger had a lot of hype surrounding it from day one (and even before that). And for me, it lived up to the buzz - yay! The Theo burger looks great. But i love the sound of the sriracha mayo on the Denise. There are a lot of these designer mayos around at the minute. Love them. Would love big tubs of them! They were both great (I took a bite of Simon's, of course). I do like a good flavoured mayo, too. They look fantastic! I'm having a hard time finding decent burgers in France. The ones which are good can be found in English pubs... or else homemade! But these seem absolutely delicious! Thanks for the review! They were indeed delicious! If you ever come to Melbourne, I'll take you there! These burgers look like paintings! Absolute works of art ;-). I take it that's not Collingwood, Ontario (Canada) - Australia is it? 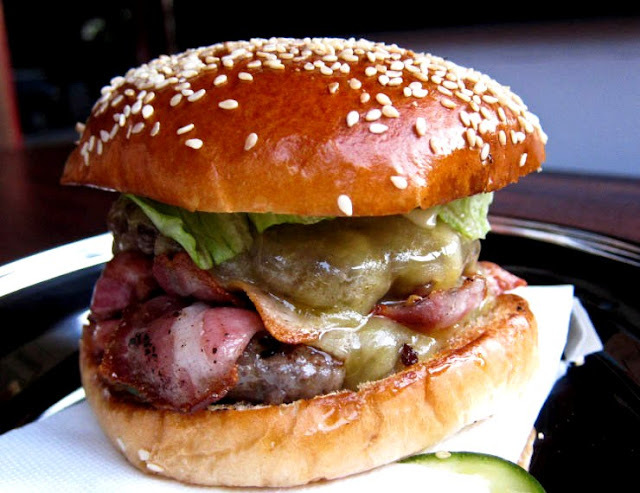 We loved our meal at Huxtable and now I'm curious to try Huxtaburger. And I agree, not all cuts are meant to be steaks and some are ideal for burgers. Perhaps you can get a burger without the bun! I didn't order the chips as it seemed they were run-of-the-mill crinkle-cut ones, but I might next time - I'm quite curious about the chipotle fries. Oh my gosh... These look absolutely delicious!!! I HAVE to come here when I'm back in Melbourne and also take Mum next time she visits... She loves Aussie burgers and wagyu so I'm sure she'd appreciate this a lot. I was quite taken aback by the small wagyu burger I got from Trunk Diner but I wouldn't mind the size here because ingredients more generous and interesting and costs way less. Good snack, thanks for the intro, Leaf! YUM! Oh you're still not back yet! That burger looks fantastic! Love the presentation too, it's amazing. Wish I could try it out for myself! Thank you! May your Melbourne trip be filled with lots and lots of delicious, delicious food. The salad does sound rather delectable, doesn't it!